Princeton’s eating club Charter has begun using consent pledges for their parties. When you go to Charter on a Friday, you are handed and asked to read a sheet of paper describing what exactly consent means. Once you’ve read it, you give it back and go have fun. 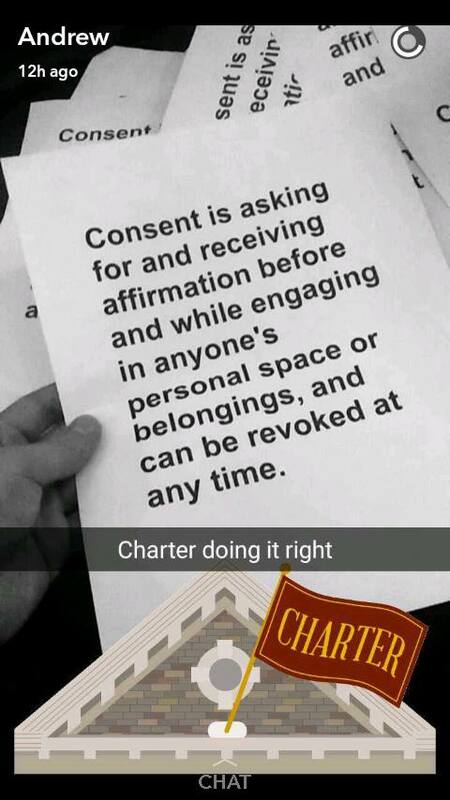 We talked to Lorena Grundy, the president of Charter, about how they came up with the idea to start using these consent pledges. “One of our officers, Will Rose, heard from a friend at Stanford that at some of their parties, they must read a similar statement before entering. We thought it sounded like a great idea, and an easy way to send the message that consent is essential, so we decided to adopt it. It’s a very simple and easy reminder to each individual, and we hope that it helps to bring the importance of consent to the forefront of the thoughts of those who enter. Lorena goes on to describe the overwhelmingly positive response to the idea during the two nights in which Charter has already implemented it. Charter is the first club on the street to do anything like this, and it will be interesting to see if the other clubs follow suit.